PhilBoxing.com >> News >> List of Articles >> Ron Galarpe: Are we aware of Tomas Rojas? Are we aware of Tomas Rojas? Tomas Rojas delivered a left against Jose Nieves. A total of 14 Filipino boxers will see action on July 2 at the historic Araneta Coliseum that probably would be the biggest boxing spectacle in the country since the “Thrilla In Manila” in 1975 -- a spectacle that could be talked about for decades or so. The spectacle will of course be lead by the world’s well-recognized most exciting boxer today Manny “Pac-Man” Pacquiao with a supporting cast who are considered the future hopes of Philippine boxing like Jimrex Jaca, Czar Amonsot and Michael Domingo. With the 14 Filipino boxers listed to see action at the fabled “Big Dome”, there is quite a distinct interest or should I say anxiousness laid down on former WBC Flyweight champion Gerry Penalosa. Out of the 14 Filipino pugilists on July 2, I bet the most hungry to strut his wares is no other than Gerry. While all eyes is on the Pacquiao-Larios tussle, I heard not much about Gerry and his opponent Tomas Rojas who I believe will give us a very competitive bout. Most Filipino boxing fans and the media as well, who are all pretty excited about the main attraction, forgot to realised that Gerry is facing a dangerous foe that could very well give us a more accurate gauge if Gerry still has it to make waves in the big league of the super flyweight or bantamweight category which have big names like Rafa Marquez, Jhonny Gonzalez, Martin Castillo, Jorge Arce, Luis Perez and nemesis Masonori Tokuyama. Tomas Rojas of Veracruz, Mexico, may have been neglected by Filipino boxing enthusiasts as a worthy opponent for Gerry. The unintentional neglect could be attributed to his record of 8 losses out of 30 pro fights. However, the fight record of Rojas does not speak well of his calibre and the facts should serve us well that Gerry is facing his most dangerous foe since his comeback match against unknown Saminkao Chutipol of Thailand in September 2004. Tomas Rojas, 26, is still considered at his prime by the Mexican boxing community and while his reputation now have been relegated to journeyman status due to his successive losses, experts still regard the Mexican as a dangerous and courageous slugger, who, if given the break, could bloom anytime soon. Rojas had registered big wins over former WBC strawweight titlist Isaac Bustos and to perennial top contender Alejandro Felix Montiel (Michael Domingo’s opponent on July 2). Rojas’ losses are also worthy to mention as much as his victories, his loss to the former invincible man in super flyweight Rosendo Alvarez was hard-fought and highly contested. His two recent setbacks to Ring Magazine’s #9 ranked best Flyweight Luis Maldonado and to highly touted Jose Nieves were a pair of controversial decisions. Rojas knocked out Isaac Bustos in just 3 rounds in 1998. After Bustos, his next big fight was against rising Rosendo Alvarez of Nicaragua in March 2000. During those days, Alvarez was feared in his division and was the first man to ever floor the great Ricardo Lopez. Alvarez was the only man who almost came close to blemish the record of the legendary Lopez, they fought twice, the first was a draw then the second saw Lopez salvaging his unblemished record via a close split decision. And because of Alvarez’ performance against Ricardo Lopez, no one had given Rojas an even chance against the Nicaraguan great. But lo and behold! Everyone were surprised to see Rojas almost had an upset over Alvarez. The fight was hard-fought and saw Alvarez always getting hurt several times due to Rojas bombs and pressure. It was only because of Alvarez’ ring savvy and experience that he salvaged his name. The verdict was unanimous but close decision with scores of 95-94, 97-94 and the last judge who probably dismissed Rojas before the fight started, scored it 97-92. After the fight, Alvarez admitted that he was surprised that Rojas was a tough customer. He said he would have lost the fight if he did not gather himself up and started to focus by using his experience. Next highlight for Rojas was his fight with perennial contender Alejandro Felix Montiel, the man who will be facing Michael Domingo this coming Sunday. The fight took place in May 2002 for the IBA belt, which Montiel was the defending champion. Rojas again surprised everybody by earning himself a 3rd round TKO. In the match, Rojas floored Montiel by a straight left in the second round. Montiel rose up at the count of eight and was able to beat round 2. The following round saw a hobbling Montiel favouring his right leg, it was obvious Montiel could not continue so they stop the fight. It was later learned that the left straight of Rojas was really hard on impact which led to Montiel’s kissing the canvas that caused the injury of his right ankle. 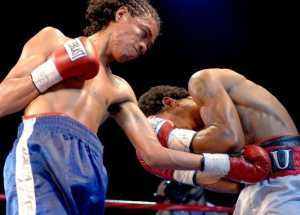 Last October 2005, Rojas was unfairly treated in his match against the undefeated Luis Maldonado. It should be mentioned that Luis “Titi” Maldonado is one of the boys under the wing of Erik Morales. Luis Maldonado is The Ring Magazine’s #9 best flyweight but Rojas seemed to deserve more the accolade from The Ring when they met last year. The fight was a 10 round event that after the contest, audience in the Dodge Arena were surprised of the verdict. The bout was originally announced as a majority draw, but then switched to a 96-94, 97-93, 94-96 majority decision win for Maldonado. It was clear that Rojas won the fight but he was obviously robbed. Maxboxing.com reported the fight as controversial. Fightnews.com scored it 98-92 for Rojas. After the bout, Jose Reyes of Fightnews.com interviewed Erik Morales and was asked of his thoughts of the fight. Morales admitted that his boxer Maldonado had a hard time with Rojas and as he recalled seeing Maldonado in trouble several times, he defended just the same by saying Maldonado did enough to deserve the win. Morales added that Maldonado did not train well for a southpaw like Rojas and they knew little about the fighter who strangely, happens to be a fellow Mexican. Tomas Rojas’ last fight was against current undefeated WBO Bantamweight #13 contender and projected future star of Puerto Rico Jose Nieves. Nieves was fresh from his UD win over the experienced veteran Angel Antonio Priolo. But his fight with Rojas was a totally different story. Nieves was obviously the more skilful fighter as he was dominating the fight after four rounds. But it seems Rojas would always have something to surprise the crowd. In the 5th canto, Rojas unloaded a storm that found Nieves on the canvas with about a minute left in the fifth round. Clearly rocked by the assault, Nieves managed to regain his composure and fought his way through the round. Apparently hungered by his success in the fifth, Rojas came out strong in the sixth, and was able to drop Nieves, yet again, about 30 seconds into the round. Surprisingly, Nieves again quickly regained his wits, and was steady on his feet just seconds after tasting the canvas. However, Rojas now had his confidence, and the latter rounds seemed to feature two fighters more evenly matched than what was earlier seen. However, the judges saw Rojas’ surge as not enough to give him the fight. The scores were 97-92, 96-92 and 95-93. It was a UD win for Nieves but the crowd that witnessed the fight booed the decision and believed Rojas won the fight. Tomas Rojas has a record of 22-8 with 14 knockouts and is now on his 10th year as a professional boxer. He is known as a pressure fighter who loves to mix it up and would always look for a KO. Boxingtimes.com described Rojas as not so skillful but crafty and gritty enough to compliment his reputation as a dangerous slugger. Rojas held the Mexican Super Flyweight belt from 2001 up to 2003. He actually simultaneously held the IBA belt in 2002 with his native Mexican belt. Gerry Penalosa came back from oblivion and had his renewed vigor in September of 2004. Since then, he chalked up 3 straight impressive wins but all against mediocre fighters. His last victim Daniel Azuaga of Argentina was marketed as a fearsome knockout fighter but proved to be a joke. This time, this writer believes that Gerry finally found a lively opponent he had been looking for. A win over Rojas would not create much an impact on his marketability. But since Rojas had proven his worth armed with a dangerous left hand with youth also going his way, this match should give us a clear gauge if Gerry still has it.